Hi guys, I created a calculator that will make it easier to overclock the memory. It works with all kinds of memory and all zen processors. 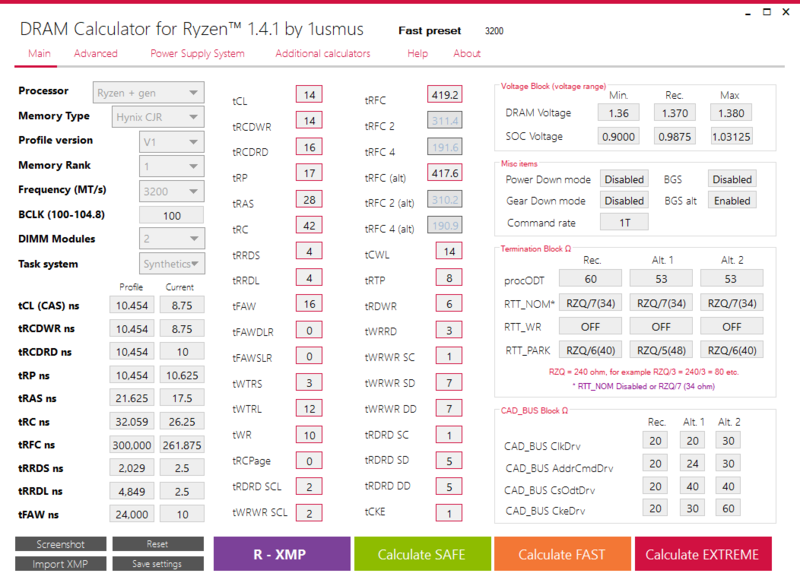 To increase the chances of successful overclocking I advise you to adhere to all the offers that the calculator gives on main page. What is a single error? Influence of СLDO_VDDP on MEMCLK "holes"
great gratitude STaRDoGG for help ! This program is publicly available for publication in news resources and preparation of reviews. The copyright to the logic of the program and the product is present. dont have a ryzen system, but nice work! Tried it with my 4*16Gb of f4-3200c14 16gtz, able to boot but memtest found error really fast so i'll try later to meddle with the timmings more. Currently going to work for the next 36 hrs ;'(. Tested timings from V2 as i see V3 gives same numbers. 500% give or take 1 hour Y-Cruncher and loads LOADS of IBT runs. Is it ok to link this topic on forums ?? Deffo out of alpha stage even passed beta stage !!! You need to mention, people need to be REAL careful with the Taiphoon Burner. Or they may brick their RAM sticks. I already went ahead and linked it, but as far it being out of any stage.... ehh? I mean thats up to 1usmus to decided if he feels its truly ready for the limelight and well... some sort of additional calc variable for blk offset would be nice. No idea how hard it would be or if it even matters, I'm ganna end up seeing if I get any sort of different results with gear down disabled now that memory is completely strapped or if a looser tRC or using tRFC ult instead does me any favors in that regard.